1957 23′ Old Style Lyman Runabout Foredeck Off! With only applying SANPACO Lyman Copper Bronze Antifouling paint to the jack stand paddle areas ahead of us, RJ and I lowered the 1957 23’ Old Style Lyman Runabout onto a pair of boat dollies this morning. He’s totally cleaned the interior of the topsides and bilge of all old paint, varnish and what have you. Now it is time to attack replacing the foredeck, toe rails and aft deck, and to release and refinish the covering boards between them. The starboard foredeck panel was replaced at some time, along with the toe rails on both sides. Rather than use ribbon cut mahogany plywood, which is correct, the new panel is what we call totally incorrect swirl-grain plywood. That it is thicker than the portside panel does not help at all. 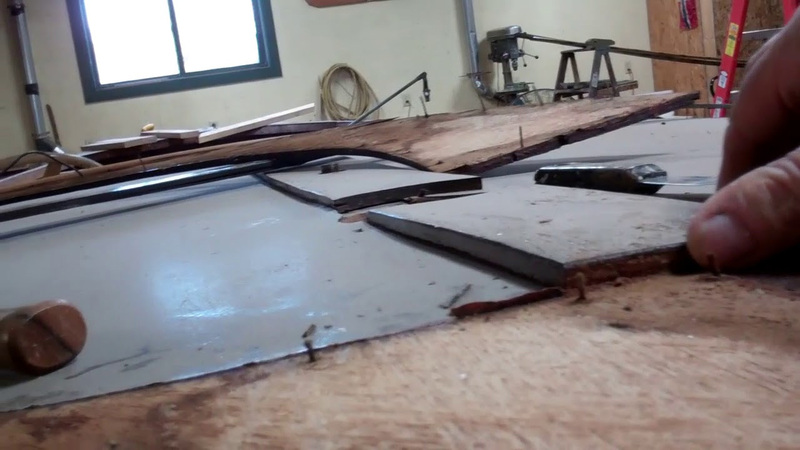 I express the hope that we can save the toe rail material in the video, but, having released both of rails now, it is clear that major plywood delamination has assaulted both of them. I quickly stripped a section of the king plank, only to discover that it too is fabricated from swirl-grain plywood. The one positive is that whoever did this work was super lazy, or just did not know. Nothing is sealed on the back sides. Nowhere is there any evidence of adhesive having been applied between the decking material and the frames. All of the delamination we have discovered is the “reward” for taking such shortcuts. We will seal aggressively, and will set everything bedded in adhesive. We have no choice but to replace the king plank and both toe rails using correct, and likely slightly thicker ribbon cut plywood. The aft deck plywood panels will be replaced as well thereby allowing her to present uniformly from stem to stern. Once the deck and gunwale framing is exposed, it will be cleaned and then sealed on all sides with three coats of CPES. Why? We spend incredible money and time staining, sealing and varnishing exterior surfaces, but so many of the boats arriving in our shop present completely raw interior surfaces. That raw wood is like a sponge that continually takes on and releases moisture, causing the wood to expand and contract beneath the wonderful varnish we have so lovingly applied. For a while the varnish is elastic enough to expand and contract with the wood, but as it continues curing, it also loses elasticity, begins breaking down and ultimately fails. We seal every piece of wood on every side we can get to. Bilges receive three coats of CPES and then three coats of the best bilge paint we can buy. If the boat is outfitted with ceilings, that bilge paint is applied from keel to gunwales. The framing is doused with CPES, as are the underside surfaces of all deck and covering boards. Once sealed, the wood becomes very stable and finishes survive much, much longer. Yes, all this sealing costs money and time, but once again, price and cost diverge. Just think of how much you save if your woody’s varnish fails in 3-5 years instead of 5 – 8 years!